This is the biggest story of the year, maybe the decade, in the football world. Maybe even the greatest story since 2002 when superstar Ohio State freshmen running back Maurice Clarett was denied access to the NFL after losing his amateur status. Clarett, as you may recall, ran in a touchdown in the second overtime using his 6′ 230 lb frame to seal the improbable win for Ohio State 31-24 over favored Miami. It was a game for the ages. The true freshmen posted 1,237 yard that year and ripped off 18 touchdowns finishing 2002 as the #1 rated running back in College and a ranking as a #1 first round draft pick once he became eligible. As the rules have stated since 1993 the NFL requires any player to be out of High School for 3 years before they can enter the league. In April of 2003 Clarett had his car broken into while he was at practice. He filed a police report and stated he had lost $10,500 dollars in personal items. It did not take long for the media and NCAA officials to move in on the star and ask questions as to why a freshmen with no job had this many valuable assets in his car. Ohio State suspended him for the 2003 season and the entire event became a side show. Knowing he was accused of violating the amateurism rules and not being able to respond Maurice threw in the towel. Out of respect for Maurice we submit for any of you to watch his story. Go in to 30 seconds and watch this amazing kid roll. He quit the team in Spring of 2004. Scouts were all over him, and agents lined up. So did NFL teams and owners hungry for the kid who had not played in a year. 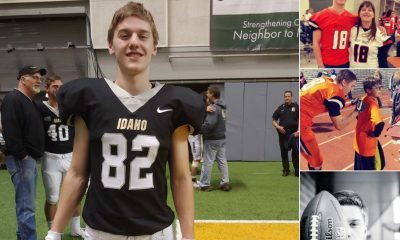 The kid who was dying to play football and get paid for his God-given talents had one big problem. He was only two years removed from High School. Clarett filed suit against the NFL seeking to remove the rule. Clarett sued the NFL citing the Sherman Act, stating that the league’s rule limiting eligibility for its draft to players three seasons removed from their high school graduation created an unreasonable restraint of trade. His case was victorious in District Court clearing his path to the League for a few weeks. The League of course appealed, and the Appellate Court found in the NFL’s favor with a decision that the League was shielded from the Sherman Act. The reason for that is complex but is rooted in the fact that the NFL and its players have a collective bargaining agreement which spells out the 3 year rule. Read the entire case here- this story is not to challenge where we are now as a football community but where we are going. Maurice Clarett would never make the NFL despite having a shot in 2005 with the Broncos. He played arena ball and other small ball but injuries, age, misfortune, and eventually crimes and drug abuse would forever derail the once Comet like Star. Read about the decline and post-football/prison life of Maurice Clarett here. Ok so given that backdrop let me opine a little. Let me spill some knowledge and well-earned beliefs on you all. The NFL and NCAA have what equates to a Monopoly. They use and manage human capital in the form of our kids and young men to fuel their machines. I envision the scene from the Fellowship of the Rings where Saruman, the Dark Lord, is creating the unstoppable Uruk-hai out of the Earth. The League through this “collective bargaining agreement” supports, no dictates, that the NCAA will get the best first. Those that survive injury, social pressures, and life get to come to the NFL. Now of course, I understand the benefits of education. We all do. But if we are honest we can all see that a career in the game of football is a fleeting thing and that ever player is one down or one practice drill away from the end. That folks is the cold-hard fact. And guess what. These same “kids” can go to college their entire life. I am 55 and still take courses and hold down a job. So why should 18 to 21-year-old men be prohibited from pursuing gainful employment? If these men, these free men, want to go for a job that can pay them for their skills I say let them. If they are willing to lose their college eligibility let them. The days of slavery may not be that far in our rearview mirror but it is. Legendary Coach Les Miles is one of many college coaches who will be the first to admit that there are many athletes he has had who are ready out of High School. Let’s all be honest here. The NFL has a completely free farm league in the form of college football. The three-year rule forces players to play college football. This gives our colleges and universities, both public and private, a work force that trades its services for housing and tuition. Hell medical and disability are not even included for college players and we now all understand that football is killing thousands of players in the form of CTE and TBI later in life. This is my 15th years covering High School football’s best. From Camps to clinics to on and off field aspects I am proud to say I have covered it all. Each year I see the best rise up and make their way on to college. Many of our best have struggled academically, no surprise here as we all get that some amazing talent is rising up from meager circumstance. Many of the hungriest and most talented athletes are in fact from places where education is way down the list when compared to shelter, food, safety and life itself. I can name at least 15 players who could have and should have been able to have moved from High School to the NFL or some other professional level but were denied. That is why I plan to be a big supporter of and advocate for the new Pacific Pro Football League. This league which was just founded by football greats Mike Shanahan and Ed McCaffrey. Jeff Husvar, a former Fox Sports executive, Mike Pereira, the league’s former officiating czar; ESPN reporter Adam Schefter; NFL Exec. Jim Steeg, and Tom Brady’s Agent Don Yee are on board too. This is going to be that option for athletes. They will get paid $50,000 a year, have training, learn the ‘Pro-Game’ including what it takes to make it as an NFL player, and be coached at a level few if any Colleges can provide. On top of all that the league, which will be based in California and will have a 6 to 8 game season, is going to offer free college at a local community college. The facts are that this experience is going to be better than almost any other college opportunity, the athletes will be paid, and they will learn what it is like to manage themselves and their incomes as a business. This is for real and should be a wake-up call for the NCAA which is now faced with multiple law suits by athletes seeking employee status and income and rights associated therewith. Please understand that I believe the best path for 90% plus of our young men is the college route. Both from an education and preparedness standpoint I believe this to be true. But there are those special athletes who I have seen fallout from injury and circumstances that I guarantee you would have been better off had this option been there for them. There is not doubt in my mind that the time for this is now and that this group appears to be ready to deliver it. Now they have a shot. Case in point. 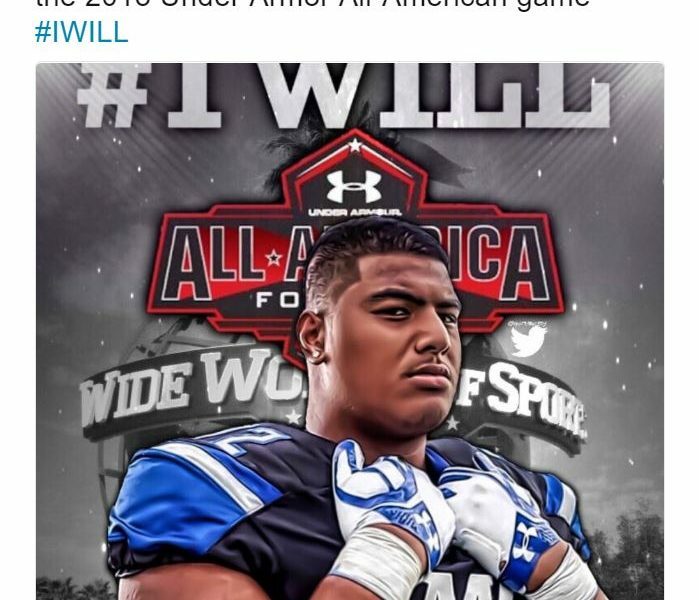 Would 6’9″- 397 pound Austrailian phenom , 17-year old Daniel Faalele, be better off going this route and managing his exposures and his future? 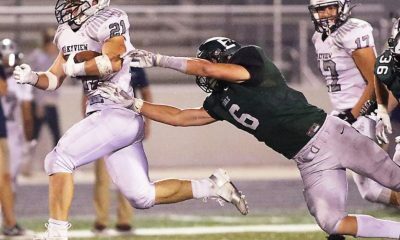 This kid has 19 major offers and has never played a down and is slated to be the next big thing. It appears he will joing IMG Acadmey but he still has to survive until he is 21. 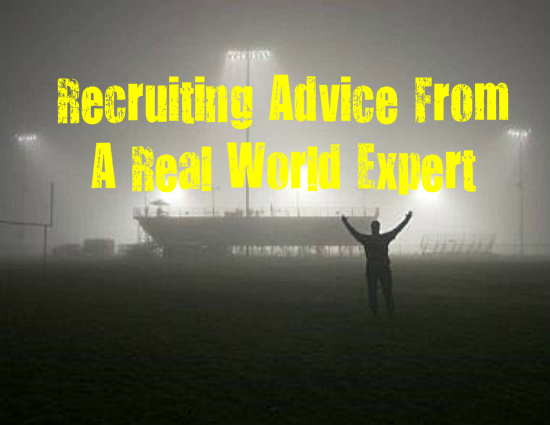 A question any super -recruit should ask themselves. This situation would allow these kids to have an Agent, to get catastrophic insurance to protect their futures, and to be on the fast track. 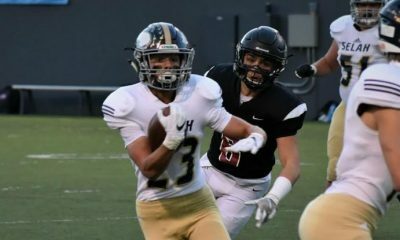 It is a very interesting wrinkle and by this time next year many of the Nation’s best may be in California skipping the NCAA path. And frankly, it is about time.